Plaque installed in 2009 at 9 rue Gît-le-Coeur, Paris. 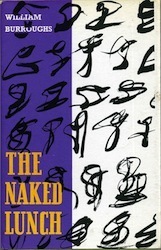 “Here are Sinclair’s ‘Last Words,’ written in Paris long before he would have been aware of any pressing need to devise a valedictory.” — HEATHCOTE WILLIAMS, from a tribute to Sinclair Beiles, in BONE HEBREW, a collection of Beiles’s writings published in 2013, in a limited edition, by Cold Turkey Press. Through the beautiful posies of neon signs. So it doesn’t show stains. Let him savour the smell of it. Be guillotined by badly played guitars in other rooms. The collar, and a suit which was shiny before I sandpapered it. What can I say to the taxi driver which is memorable enough. I am too overcome by the outrages perpetrated against me. With a beautiful zizzard of neon flashing through the window. Let her invent my last words with all her experience. This seems to be working out well for Sinclair – as it should for the First Man in Space. That’s how he understood what Burroughs was doing and could fit together NAKED LUNCH. Sinclair should always be flying above it all. For interested readers, this article https://www.emptymirrorbooks.com/beat/sinclair-beiles-a-man-apart gives a more accurate view of him. “… the sad, mad and bruised old mind that was Sinclair Beiles was at root the mind of a natural ecstatic, a luftmensch, of the kind that society is always inclined to punish for one reason or another, which is why unreason is sometimes such an attractive escape route, along with the trickster’s madness . . . though it is tempting to think that Sinclair was perhaps also privately haunted by some dark demons buried deep in his DNA, the dybbuks and golems of the shtelt which no one would ever be able to do anything about (and Sinclair must certainly have tried — he ran through psychiatrists like boxes of Kleenex”). Thank you for opening up this Pandora’s Boxing match for us eager readers. 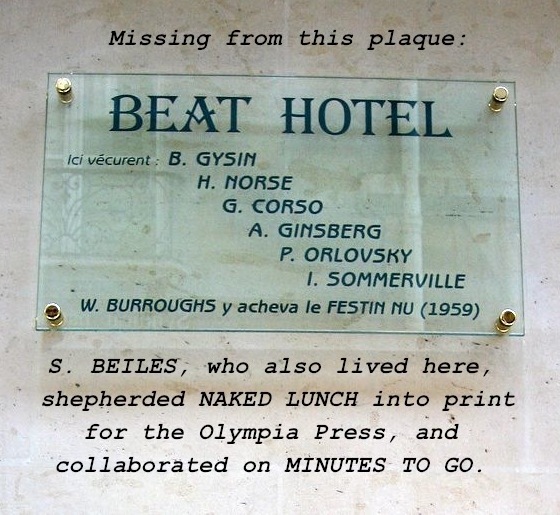 I’ve always been puzzled by the conspicuous absence of Sinclair’s Name on the Beat Hotel Plaque but not oblivious to the role he played with MINUTES TO GO. Collaborations are interesting social situation soups to sip and swim in. But typically, when the credits roll, names of major players are often omitted. Biases and rumour mills are sometimes the causal reasons for the omissions. This seems to be the case with Sinclair’s name and The Plaque in Paris. Perhaps Professor Harris can deliver on that possibility of a postscript. if all the others let SB have some of their letters then he’s sorted. 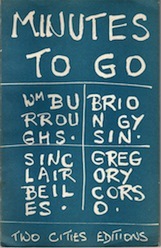 and I’ve nicked an extra S from the always generous Ginsberg for Burroughs’ missing middle initial. I suppose more properly it should be as below::: since the only rationale I can make out for the running order is the number of letters in the name and if equal then by earlier birth date …. SB screws it all up because no-one seems to know his exact dob – 1930 or 1931. Sinclair Beiles was so wonderfully awkward. Oh! and how to pay for the new signage? Sell the old one! .. some sad old collector is bound to stump up the readies for it… I’ll give you a £100 for it right now, J-J …Agreed?